In this lyrical, Quaker retelling of the New Testament saga, readers are invited in to experience the resonant silences in the written record by joining the storytelling carpenter Yeshu, his young neighbors Daavi and Shoshana, and a band of fellow seekers as they travel through wilderness, village, and city in search of what is divine and what it means to be human. Brimming with adventure, laughter, and natural beauty, the quest they share forever alters their lives, and still impacts ours. The brother and sister who are the eyes and ears of this telling step out of the obscurity of history to show us that the meaning of the public story we thought we knew eludes us until our personal story makes it our own. Before Daavi can take his first footstep at Yeshu’s side, Shoshana goes mysteriously missing, leading him on a search to save her that puts his own soul in the balance during his journeys with Yeshu and beyond. 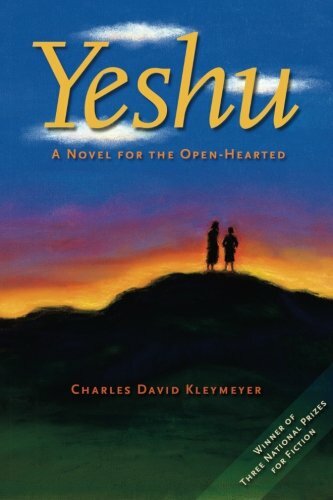 When the novel opens, Daavi is a young lad helping out in his neighbor Yeshu’s workshop. He hands the carpenter tools and fetches him water from the village well. In return, Yeshu tells Daavi stories. Over time they forge a friendship that is deepened by the arrival of Yeshu’s second cousin Yohanan, who wanders the wilderness, emerging from time to time to sing praises of the natural world and baptize seekers of the spirit. Among those seekers are the “lost soul” Maria Magdalena and the exuberant Thunder Brothers, James and John. They treat the lad as their equal, and he blossoms in what will become enduring friendships. The transformative impact of Yeshu’s teachings and example are illuminated in the dilemmas facing Daavi and his friends, and in the choices they make and avoid. They are challenged to embrace all living creatures as sacred, and the role of family and community are pitched against responsibility for the destiny of society. Each of them must answer their questions personally, and Daavi’s lifelong road to clarity of insight and effective action is neither level nor straight. This novel is intended for readers of all ages and spiritual backgrounds. It was written by a storyteller about storytellers, including one of the premier tellers of all times, a Jewish village carpenter from Nazareth. This book shares a seeker’s journey in which the end is the beginning. Charles David Kleymeyer is an award-winning writer and applied sociologist with a lifetime of experience serving organizations and communities of low-income ethnic groups throughout the Americas. He has published short stories and poetry, and during a Fulbright Fellowship in highland Ecuador, he produced a trilingual collection of documentary short stories—in Spanish, Quechua, and English. Over the past decade, he has published six stories from the novel, one of which won an Award of Merit for a Seasonal Article, from the Associated Church Press. His professional publications include four books and more than thirty articles. As a Creative Writing major at Stanford University, the author studied under Wallace Stegner. He then served in the Peace Corps in Peru, and subsequently earned an M.S. in Sociology and a Ph.D. in Development Studies from the University of Wisconsin. His career in international grassroots development is still ongoing. For five decades, the author has been a performing storyteller at folk festivals, spiritual retreats, Indian reservations, and on radio and television. This avocation shaped his narrative voice, while his cross-cultural international development work molded his philosophical and ethical outlook. The life lessons and oral history techniques he learned from Indians and Blacks throughout the Americas have informed his vision of the teaching style and humanistic practices of the historical Jesus and other New Testament figures. These lessons of love, compassionate service, and forgiveness were amplified by his long-time spiritual commitment to the Religious Society of Friends (Quakers). More than thirty years of involvement with the Friends Wilderness Center, a spiritual retreat center adjoining the Appalachian Trail in West Virginia, deepened the author’s environmental ethic and rooted the book’s narrative in the powerful connection between nature and the spirit, and in the human imperative to care for the Earth. The author is the father of two adult children and a teen—all three of whom have served as his fiction editors. He visits classrooms and libraries where he presents a self-scripted performance—in first-person and authentic costume—of Abraham Lincoln telling stories of his Indiana childhood and how it impacted him as a father and a President. Story is this author’s story.